Boxing Coach: Dzhokhar Tsarnaev Followed Brother "Like a Puppy"
A former boxing coach of Boston Marathon bomber Dzhokhar Tsarnaev's late brother says Tsarnaev was "like a puppy following his brother." The defense called John Curran as a witness Tuesday in the sentencing phase of Tsarnaev's trial. 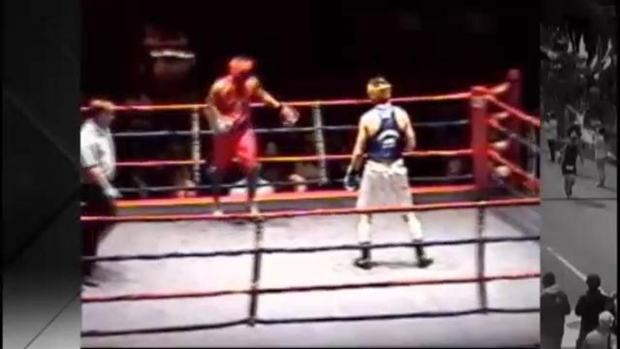 Curran said Tamerlan Tsarnaev had some success as an amateur boxer when he was a teenager. He said Dzhokhar, who was then 10 or 11 years old, came to the gym twice with Tamerlan, and the two brothers appeared to have a close relationship. A jury is deciding whether Dzhokhar should spend the rest of his life in prison or be executed. Also testifying Tuesday for the defense was Mark Spencer, a computer expert who said a computer belonging to Tamerlan Tsarnaev's wife, Katherine Russell, contained Internet searches done more than a year before the bombings for search terms that included "rewards for wife of mujahedeen" and "If your husband becomes a shahid, what are the rewards for you?" Three people were killed and more than 260 were wounded when the Tsarnaev brothers set off two pressure-cooker bombs packed with shrapnel near the marathon's finish line on April 15, 2013. Dzhokhar Tsarnaev, 21, was convicted this month of all 30 charges against him. A jury must now decide whether he should spend the rest of his life in prison or should be executed. Dzhokhar Tsarnaev's lawyers have argued that Tamerlan Tsarnaev was the mastermind of the bombings and led Dzhokhar, then 19, down the path to terrorism. They say Tamerlan became radicalized, and his wife, an American from Rhode Island, also showed signs of becoming a religious fanatic. 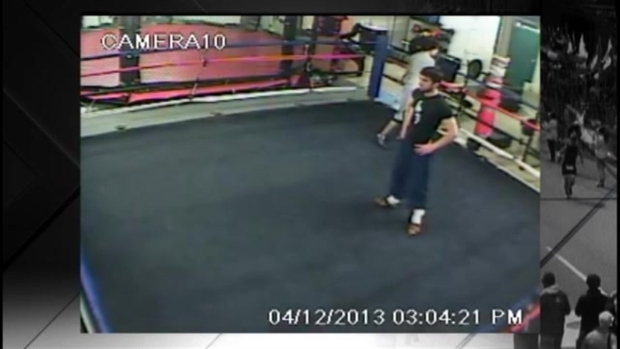 In a piece of evidence used in the Boston Marathon bomber death penalty trial, Tamerlan and Dzhokhar Tsarnaev are seen at a Boston gym three days before the 2013 bombing. Katherine Russell's name came up Monday, the first day of the defense presentation for the penalty phase of Dzhokhar's trial. Her best friend, Gina Crawford, testified that she texted Russell the day of the bombings to ask if she was OK. Crawford said Russell texted her back, saying she was fine and as far as she knew, Tamerlan Tsarnaev was at home in Cambridge at the time of the attacks. Crawford said Russell added a curious statement after that, texting, "a lot more people are killed every day in Syria and in other places." She added in another text: "Innocent people." In 2013, Russell's parents and sisters were called before a grand jury investigating the bombings. At that time, Josh Dratel, a lawyer who represents Russell and her family, said he had been told by prosecutors that Katherine Russell was not a target of the investigation. Amato DeLuca, another attorney for Russell and her family, has said repeatedly that Russell didn't suspect her husband of anything before the bombings and nothing seemed amiss in the first few days afterward. Russell lived with Tamerlan and their young daughter in the Tsarnaev family's small Cambridge apartment. DeLuca told The Associated Press last month that he and Russell have not heard from federal officials in a year, since shortly before the 2014 marathon. Amato said Russell has not been identified as a witness for prosecutors or for the defense in Dzhokhar Tsarnaev's trial. Russell's mother, Judith Russell, testified Monday that she and her husband weren't happy when Katherine began dating Tamerlan Tsarnaev and that they tried to encourage her to break off the relationship. She said Tamerlan Tamerlan became increasingly strident about religion and the U.S. He talked about "this country's influence and harm to Islamic countries," she said. Dzhokhar's attorney David Bruck said in opening statements that Dzhokhar was "a good kid" who was led astray by his increasingly fanatical brother. Bruck said there is no punishment Tsarnaev can get that would be equal to the suffering of the bombing victims. Prosecutors have painted Tsarnaev as an unrepentant killer who deserves to be executed for his crimes.